While we haven't had much snow where I live yet, Old Man Winter is creeping in. During winter, I enjoy being outside with my kids making snowmen and having snowball fights. We also tend to be out and about visiting friends during the holidays. With the snow and slush that comes with winter, it is important to me to have warm, waterproof boots that I can wear to keep my feet dry while I am outdoors. Recently, I was given the opportunity of reviewing a pair of eco-friendly boots by Jambu from their fall line. Inspired by the beauty and mystique of the rainforest, Jambu™ Footwear is designed to guide you in style and comfort on your next personal journey – at home or across the globe. Let Jambu™ join you as you zip line through the rainforest, stroll the beach, navigate the city, or travel the world. Be you with Jambu™. JAMBU™ uses only 100% recycled, recyclable and re-usable packaging. Jambu™ outsoles are made with partially recycled and re-usable compressed rubber. In this small way we hope to preserve our great outdoors for future generations. Renew with Jambu™. When Jambu presented me with the offer to review shoes, I was torn. Jambu makes cute, comfortable, eco-friendly shoes, and ALL of them appeal to me. I settled on the Nomad boots because I was looking for a boot that I could wear whether I am walking the dog or going out for the night with my family or friends. The Nomad boot fit me needs perfectly. Not only is it stylishly cute, it is also practical. Standing at about 11- inches high and weighing one pound the Nomad - Waterproof truly lives up to its name. Made with waterproof leather and brushed suede this shoe is the perfect example of comfort and security. This boot is built with laces so that you may design your own comfort! It is available in black/grey and brown/saddle. This shoe is surely t be the perfect fit against any surprises that the weather might bring. Cold, rain, hail, snow move over! The Nomad-Waterproof is here to make sure that style and comfort prevail against any weather surprises! As soon as I first saw the Nomad boots, I liked them! The design super-stylish. 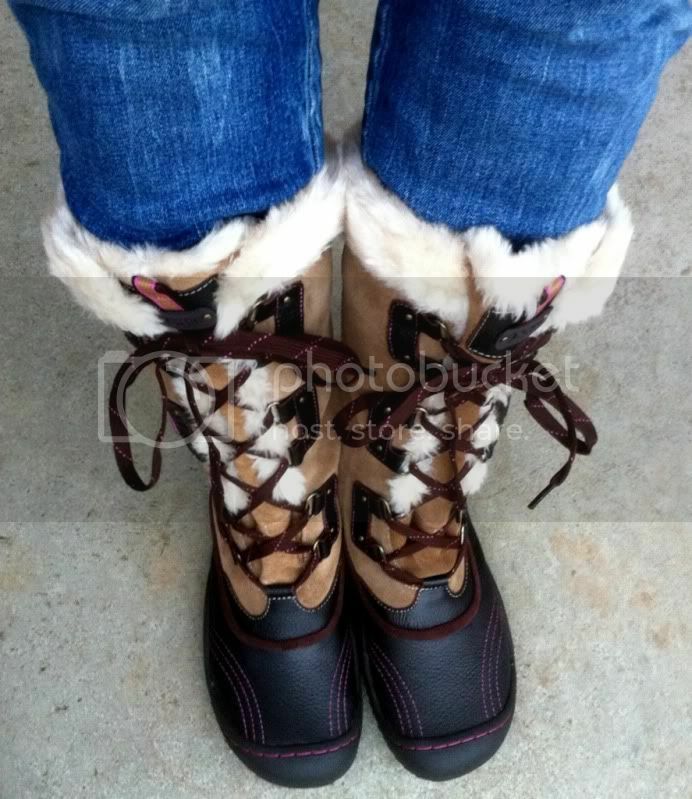 The fau x-fur trim and the pink contrast stitching are my favorite details, in addition to the fact that these boots are toasty and waterproof (a very important detail for when I am chasing my dog through slush puddles!) Most boots that look cute are not comfortable. 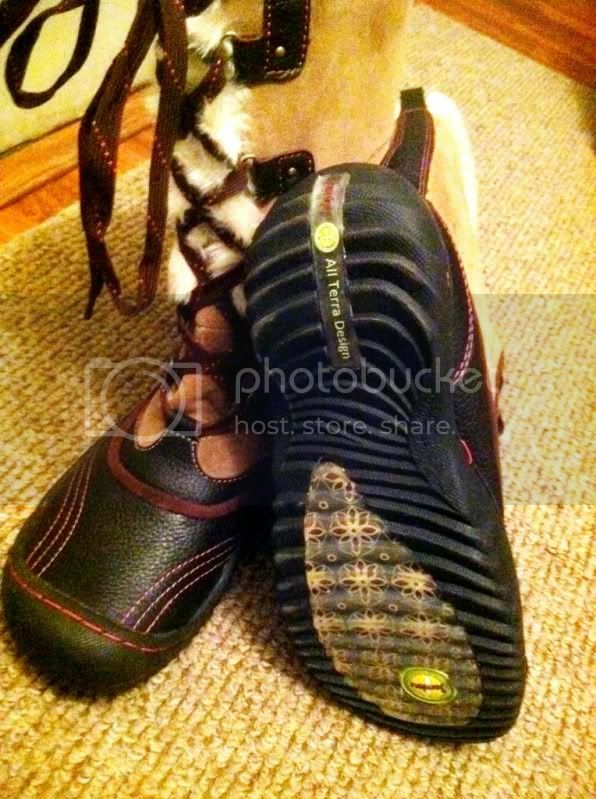 Well, Jambu got it right with these Nomad boots because they are both. The Nomad boots fit great too! I ordered a size 7, my regular shoe size, and am pleased that even with a slightly thicker sock, these boots still fit great! I am so ready for the snow now! I highly recommend Jambu shoes! Check out their website to see all of the beautiful styles available for both women and children.